Bernice, or ‘Bea’ as everyone called her, served as an education Volunteer and taught English at the public junior high school in the community of Salimani, on the island of Grande Comore in Comoros. During her service Bernice made many notable contributions and shared her love of cultural heritage with both her students and community members. She established a Junior Exploration Club for students and secured funds to take students on field trips to heritage sites in Comoros. She also worked closely with the National Museum of Comoros to create written descriptions for displayed artifacts. Bernice received her bachelor’s degree from the University of Illinois at Chicago. While living in Chicago, Bernice was a Discovery Squad volunteer at the Field Museum, where she shared her knowledge and interest in the museum’s artifacts with visitors. 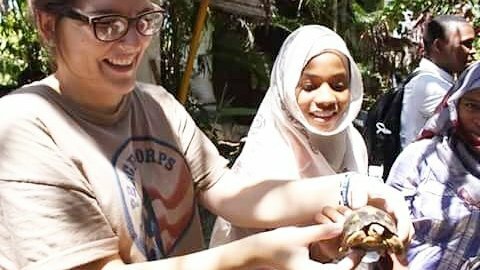 All donations to the Bernice Heiderman Memorial Fund will support approved Peace Corps Partnership Program (PCPP) projects in Comoros. Bernice during her Peace Corps service in Comoros.